This sequence of panels in faded yellow and red ochre plaster-relief now graces the back of the bicycle stand outside King's College London's Chancery Lane Library. As the information plaque there says, it was salvaged from a wall of the old St Dunstan's House office building on nearby Fetter Lane, which leads from Fleet Street to Holborn. The publishers of the 1876 English translation of Jules Verne's Around the World in Eighty Days, Sampson Low, Marston, Searle & Rivington, were housed at 30 St Dunstan's House in late Victorian times. The company also produced maps, children's books etc., so it is tempting to assume that this was their commission. The panels are notable for their Arts and Crafts style, and their interpretation of world cultures at that time. 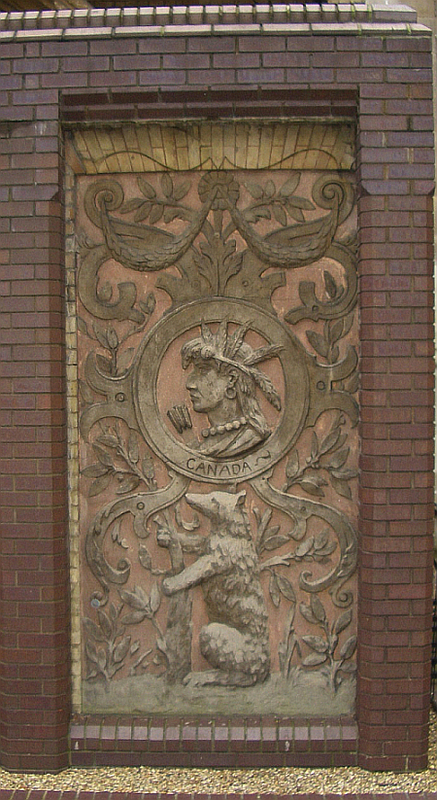 Between the longer panels depicting America (represented by a liberty figure in a liberty cap) and Canada (represented by a native Indian complete with beads and earring, and a very fine bear), are Australasia, Europe, Africa and India. Australasia is represented by a hunter/settler; Europe by a sovereign with a crown reminiscent of a castle; Africa by a noble-looking African with large beads and a large earring; and India by a wise, visionary Indian wearing a turban. Despite the presumption of Europe's supremacy, a great deal of respect is given to the other figures — including the animals. The work accords well not only with Crane's style but also with his open-heartedness, his penchant for emblematic figures (Crawford) and his fondness for and accuracy in depicting animals ("nurtured by regular visits to the London Zoo," Carpenter 133). Carpenter, Humphrey, and Mari Prichard. Entry on Walter Crane in The Oxford Companion to Children's Literature. London: Oxford Univ. Press, corrected ed, 1985. Crawford, Alan. "Walter Crane (1845-1915)." Oxford Dictionary of National Biography. Viewed 28 May 2007.